While growing up in southeastern Ohio during the late 1940s and early 1950s Jerry Norris learned a lot about old cars from his father. “My dad and his friends were driving Super and Modified Stock cars,” Norris remembers. The favored cars they would soup-up for racing were coupes from the 1930s, a fact not lost on young Norris. “I always had it in the back of my mind to own my own 1930s Coupe someday,” Norris says. He was not shy telling other people about wanting such a car. In the spring of 1978 the long search ended when he was tipped off about a 1939 Plymouth coupe near his California home. Norris inspected the Plymouth and found the very large trunk was full of spare parts, including an engine and transmission. After purchasing the car he nursed it home and began taking inventory. “My goal was to rebuild the car in my garage to the point that I could use it as my everyday car,” Norris says. Having all those spare parts helped ease the task of rebuilding. 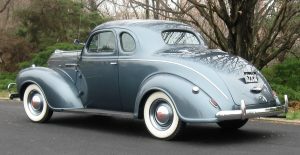 After purchasing a shop manual for a 1939 Plymouth and some critical tools, Norris commenced removing the inline six-cylinder engine and the three-speed transmission. Over time, the diligent Norris rebuilt the engine, drivetrain, brake system, wiring harness, hoses, and countless small parts. With the mechanical parts in working order, Norris bought “How To” books for bodywork, painting, instrument rebuilding, wood graining for the dashboard, and garnish molding. He became a self-taught restorer and within a couple of years the 3,044-pound coupe was reassembled and rolled out of the garage on new 6.00×16-inch tires. For almost five years the presentable Plymouth became a daily driver for Norris. Both of his daughters learned to drive a stick shift via the manual transmission in the Plymouth. The shift lever is located on the steering column. In the mid 1980s Norris was transferred to the East Coast and the Plymouth came with him. It was his only car for some time and proved to be trustworthy. Upon retirement in 1992, Norris moved to northern Virginia leaving his Plymouth behind for several years with a couple of amateur mechanics who did some engine work, and a body guy who fiddled with the car, before putting the coupe in storage. “After several years, my family got after me to get the car out of storage and have it professionally restored,” Norris recalls. Finding a reliable restoration shop wasn’t easy but finally Norris settled on Fantom Works to bring his Plymouth back to like-new condition. The coupe now wears a coat of Shadow Green paint with the seats covered in tan upholstery. The woodgrain dashboard houses a 100-mph speedometer and AM radio. The optional heater and cowl ventilator keep occupants comfortable. Suspended from above the two-piece windshield are the vacuum-powered wipers. The vehicle is enhanced by such minute details as front fender-top lights and a Plymouth emblem in the lens of the taillights. The three-spoke banjo-style steering wheel is shoulder wide to provide leverage in steering. Distinctive square RITEWAY headlights easily identify the 1939 Plymouths. The optional amber fog lights are MOPAR products. An oil bath air cleaner sits above the engine. An 18-gallon fuel tank feeds the L-head engine. Only 5,978 such Plymouth models were produced, each with a 114-inch wheelbase and a base price of $895. The number of survivors is a mystery. Now that the professional restoration is complete, Norris announces his Plymouth is finally a “true car” done correctly. Would you like to be considered for a Classic Classics article?